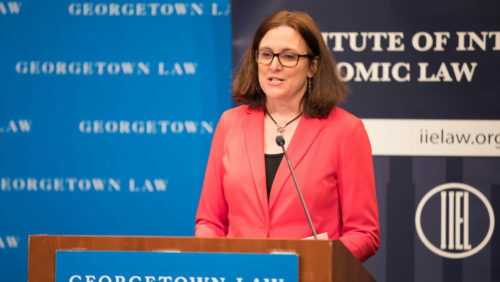 European Union Trade Commissioner Cecelia Malmström spoke at Georgetown Law’s 40th Annual International Trade Update on March 7 to 8. Malmström, Europe’s chief trade diplomat, gave a broad view of trade from the European perspective in her remarks, officially known as the 3rd annual John D. Greenwald Memorial Lecture. She spoke in Georgetown Law’s Hart Auditorium — one day after meeting with United States Trade Representative (and Georgetown Law alumnus) Robert Lighthizer (C’69, L’73) in Washington, D.C.
“The U.S. and the E.U. often agree on…what the global challenges are, and the threat that they pose, but we do not always agree on a cure,” Malmström said. Instead of promoting the common values of free trade, open borders and security following World War II, people are now starting to question the value of the systems that have underpinned growth, in part as a backlash from the pains of globalization, she said. As more than one participant noted during the two-day conference, there was no lack of topics to talk about on the subject of international trade: Challenges to the Global Trading System, Trade and Presidential Authority, and the WTO year ahead, and more. The event was hosted by Georgetown Law’s Continuing Legal Education and co-sponsored by its Institute of International Economic Law. “You won’t get the opportunity every day to engage people of this stature,” Professor Chris Brummer, IIEL’s faculty director, said to the students in the audience, as he welcomed Malmström, as well as members of her cabinet and the European Commission to Georgetown Law. Greenwald, the late Georgetown Law adjunct professor for whom the lecture is named, played a role in drafting every major piece of trade remedy legislation in the 1970s. Malmström, who hails from Sweden, has a similarly distinguished record in public service, Brummer said.